We all felt pretty good and it was evident on the first strength portion as I saw some big weights going up. For me, I started at 95 then went to 135 and did a heavy single at 165. That all felt good and I was ready for the Work Capacity portion. We have not done Nancy in quite some time so i was excited. I could tell that both Trevor and Mike Drew were also ready to go this morning. On the first run, I took the lead with Trevor close behind. Mike sandbagged a little and I didnt really see him until the second set. Usually on a workout like this, Trevor will be faster than me on the weightlifting but I can catch up and pass him on the run. Sometimes, depending on the workout, I can maintain the lead and others he kills me. On this one, it was back and forth for the entire 5 rounds. On round 3, Mike took the lead on the run by a pretty good margin and kept that lead the rest of the time. Trevor and I continued our back and forth. I thought I could beat Trevor today, but he caught up and passed me on number 12 of the last set of 15 overhead squats. Mike Drew set an all time gym record of 12:07! Outstanding work, Mike! I looked through my whiteboard times. I have done Nancy 12 times and my best was 12:37. However, when I looked at the date, it showed me that time was done at the old RRL which had a flat 400 m run. I felt good that today's time would have probably been as good if not better than that time considering that we run our 400 now on a steep hill. Getting older, but getting better. Lifting with Hayden this afternoon at the YMCA. Looking forward to it. 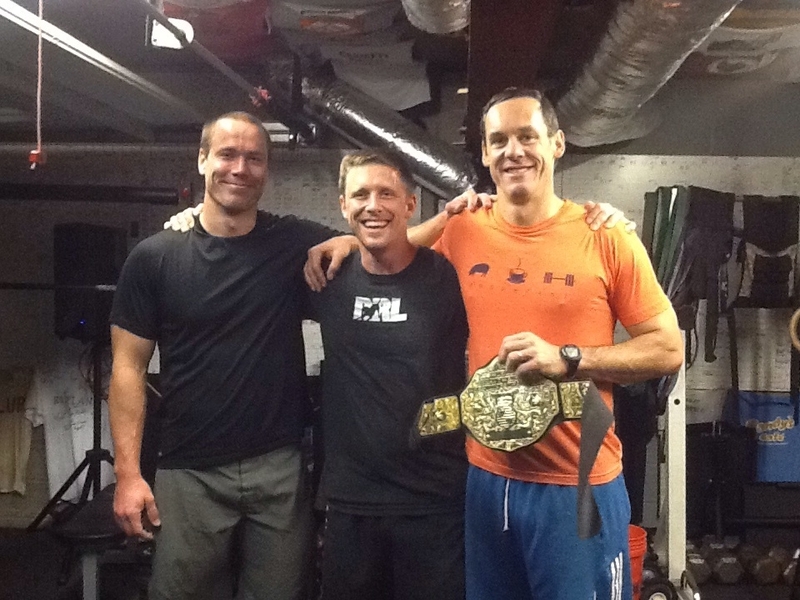 Congratulations to Mike for his 12:07 Nancy Rx and winning the Mankind Memorial PR Belt this morning! Great job!